From Dock To Dish: A New Model Connects Chefs To Local Fishermen : The Salt Prominent chefs are signing up for restaurant-supported fisheries: They commit to buying fresh-caught seafood, whatever the species, from local small fishermen. A pilot program launched in California. Sixteen Santa Barbara-based fishermen are participating in the Dock to Dish pilot program in California. Here, Charlie Graham fishes for lobster on his vessel, the March Gale, out of Santa Cruz Island. Call it an evolutionary leap from community-supported-agriculture programs, which support local farmers, and community-supported fisheries, which support small-scale fishermen. Both models rely on members who share the risks of food production by pre-buying weekly subscriptions. But chefs buy seafood in quantities that dwarf what individuals or families can purchase, so restaurant-supported fisheries could take the concept to a whole new level. 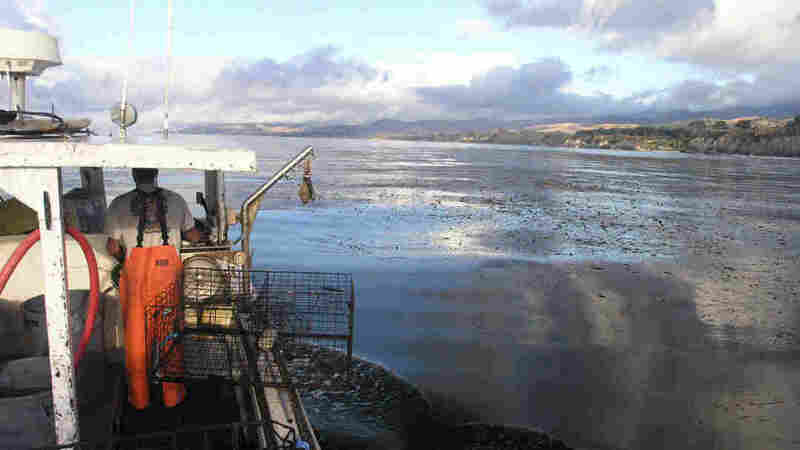 Cimarusti is acting as the pilot chef for California's first such fishery, run by an organization called Dock To Dish. To start, Cimarusti has agreed to buy at least 300 pounds of whole, unprocessed, fresh seafood a month from 16 Santa Barbara-based fishermen participating in the program — approximately a four-day supply for his restaurant. @docktodish delivered beauty to @providencela this morning. The team is so excited to be a part of this program. This White Sea Bass did not come easy. This fish represents months of planning, conversations and emails. I hope that @docktodish here in Southern California grows to the size of its sister program in Montauk. Best of all is that Sarah promised she could get me on a boat to tangle with a beast similar to the one I'm holding here. I'm going to hold you to that Sarah. Cimarusti is a longtime advocate for sustainable seafood. Participating in the program guarantees he'll have consistent access to the freshest California fish available, caught by small-scale fishermen using sustainable gear including hook and line, traps and spear. What the chef won't have is any control over the species that will land in his kitchen each week. "With this model, the chefs aren't telling us what they want — whether it's good weather or fish are biting," says 39-year-old fisherman Eric Hodge. Instead, Hodge and other local fishermen will supply Cimarusti and future participating chefs with whatever nature, skill, and a little luck land for them each week. And because the chefs will buy the fish whole, hours of intense labor — cleaning, gutting and filleting — will now fall to restaurant kitchen staff, instead of the fishermen. This week, Cimarusti is scoring some gorgeous yellowtail and white sea bass. But at other times there's a strong possibility the chef may have to persuade his customers to choose less familiar, but locally caught, sheepshead or shovelnose guitarfish instead of the usual halibut or salmon. And species like mackerel, anchovies and market squid — which diners might think of as bait — may also end up on his menu frequently. He'll have to think fast on his feet about how to transform the unfamiliar into the enticing. 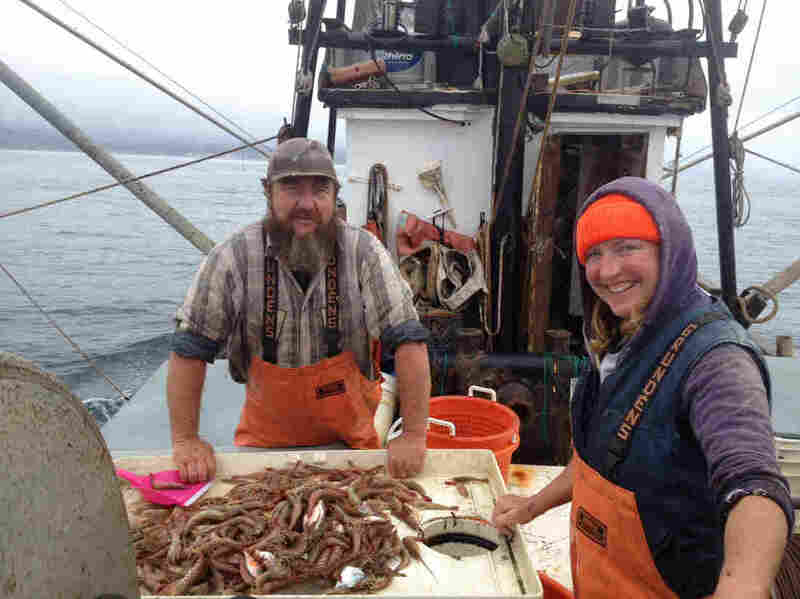 Fisherman Eric Hodge (far right) is participating in the pilot Dock to Dish program in California. 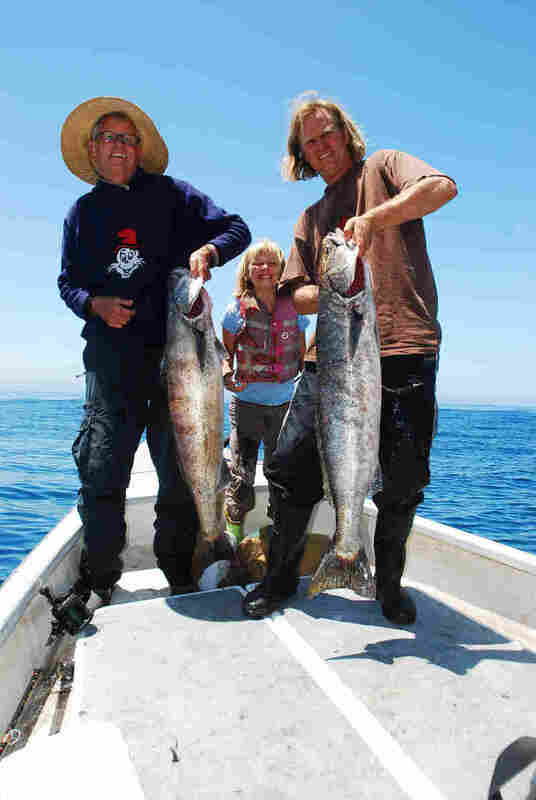 He's seen here with his father and his daughter Amber, holding white sea bass. "We have a 10-year repertoire of dishes we can call upon," says Cimarusti. "Necessity is the mother of invention. Maybe the excitement of bringing in all these new things will spark inspiration. When 75 pounds of fish shows up at the back door and you have to do something with it, it's an exciting challenge." The idea behind the restaurant-supported fishery isn't only about moving chefs away from the mostly imported seafood we typically eat: shrimp, tuna, tilapia and farmed salmon. For fishermen like Hodge, it means he will be able to consistently sell his catch at a higher price than he can get from a wholesaler, enabling him to keep the Myrna Louise, his 17-foot, biodiesel-powered skiff named for his mother, afloat. And that's a compelling draw for Cimarusti. "I'm so often asked about issues of seafood sustainability, and I always feel that it's incredibly important. But the side that is seldom discussed is about those who rely on the sea to make their living. We're hoping to keep American fishermen on the water," says Cimarusti. While Cimarusti is testing the waters on the concept in LA, it's already a success in New York, where Dock to Dish co-founder Sean Barrett launched the restaurant program in 2013. Today, 15 chefs — including powerhouses like Dan Barber, April Bloomfield and Eric Ripert — pay $3,225 a month for 300 pounds of locally caught fish. More than 60 restaurants are on the waiting list clamoring for a spot, including Craft Restaurant, owned by celebrity chef Tom Colicchio. Chef Dan Barber, of Blue Hill restaurant and author of The Third Plate, says the entire concept of moving a CSF-style program to the restaurant level isn't simply about chefs having a more diverse seafood menu or about fishermen catching "fish at the best possible moment, because they'll know they have a market for it and will get paid extra for it." He says Dock to Dish radically upends the economic model for how fish are sold and distributed. "This is a different paradigm — and it's a little bit shocking" for chefs, says Barber. He says it's very likely that a chef could, at some point, end up with a week of sardines and anchovies. Barrett is confident the idea will flourish in LA, and he has partnered with Sarah Rathbone, co-founder of Community Seafood in Santa Barbara, to run the program. Rathbone has been operating a CSF with local fishermen for several years. She and Barrett decided to partner on bringing Dock to Dish to the West Coast after meeting at a sustainable seafood conference two years ago. Rathbone says they won't sign up other chefs until the pilot program with Cimarusti has had time to work out any problems, but excitement over the concept is already growing. "I was approached by a chef from a restaurant who wanted to be part of the program. He said, 'Tell me what you want me to do? Do I need to audition for you?'" says Rathbone. "That immediately touched me and shows the love for what we do." Keith and Tiffani Andrews fish for ridgeback shrimp on the fishing vessel Alamo. He says the restaurant-supported-fishery model elevates those fish from trash to treasures, by making them the centerpieces of fine dining — while also supporting American fishermen. "Diners want a good seafood dish, but they want to feel good about it, too, and this aligns with their values," he says.